Just like with solar, which ranges from huge solar farms to small-scale residential solar panel kits, you now also have the option of installing the best home wind turbine for your particular situation. Wind energy has seen a huge popularity increase over the last 10 years, mostly pushed forward by utility-scale wind farms–the rows of giant white wind turbines you’ve seen driving through the desert or plains. Case in point: in 2016, our total wind capacity in the US equaled 82,000 megawatts. Compare that to our capacity in 2000 of just 2,539 MW and you begin to comprehend how much the industry has grown! If you’re interested in installing a home wind turbine, many manufacturers are currently making small residential turbines. We’re not talking about those big companies like Siemens, MingYang, and GE who make utility-scale equipment, but smaller companies you might not be familiar with. This makes it more difficult to evaluate a product. To alleviate this issue, we’ve made a short list of the best home wind turbines, considering factors like home wind turbine cost, value, and manufacturer reputation. But before we get to our list of the best wind turbines, let’s quickly go over the basics of home wind turbines. 400 watts: Very small turbines useful for small off-grid applications or pairing with a solar installation. 2kW: About 12 feet in diameter – too small to cover a typical home’s energy use, though it could pair well with a solar installation. 5kW: The most common size for residential applications, about 18 feet in diameter. 10 kW: About 25 feet in diameter. The size of your wind turbine depends on your energy use and the available wind in your area. Wind turbines can be combined with solar installations, complementing each other: when the weather is clear and the sun is shining, your solar panels are hard at work. When it’s cloudy and stormy, your turbine is pumping out electricity. Wind turbines can be used both off-grid with batteries or on-grid in conjunction with utility electricity. For the latter situation, your wind turbine works just like a solar installation. It generates electricity when the wind’s blowing, which you can then use in your house. If you aren’t home, any excess electricity you produce and don’t use is put into the grid and distributed elsewhere. Just like solar installations, wind turbines need inverters to change the electricity produced from direct current (DC) to the alternating current (AC) that our electricity grid and homes use. You can purchase turbines as home wind turbine kits so you can DIY or hire out the installation if you aren’t comfortable. Got the basics down? Alright! 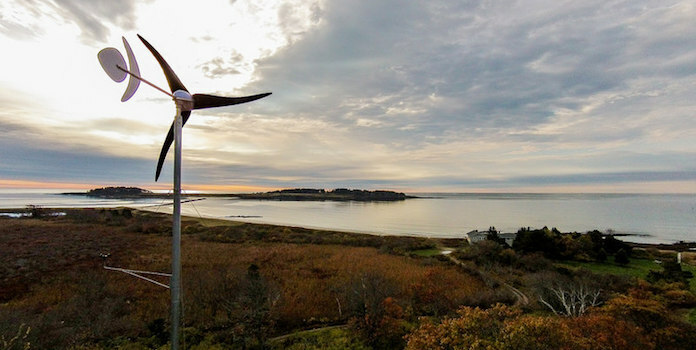 Let’s look at our list of best home wind turbines! Primus is a well-respected brand with a good warranty. 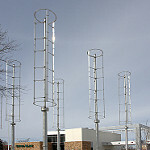 Each turbine is made in Colorado and over 150,000 of these turbines have been installed all over the world since 1995. The Air 30 is only for off-grid applications and designed to complement your solar system. With 12 MPH winds, the Air 30 will produce around 30 kWh a month – roughly about 3.3% of an average grid-connected home’s electricity usage (obviously, off-grid homeowners are going to be much more stringent with their energy use, but we include this stat here for context). These turbines have a built-in charge controller and can be wired directly to your battery bank, so there’s no need to mess around with your solar wiring. The turbine rotor is just under 4 feet wide and weighs just 13 pounds, so it should be pretty easy to maneuver and install. 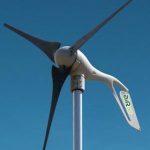 If you’re off the grid and want a simple, very small-scale wind turbine from a well-respected manufacturer, this is definitely the one. 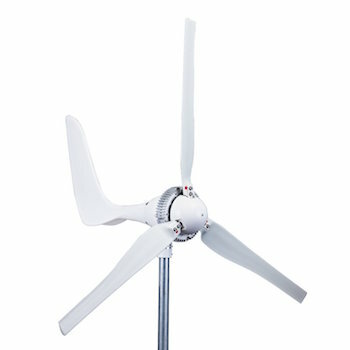 If you are looking for the cheapest windmill possible, take a look at the Windmill 1500W turbine on Amazon. It comes with a charge controller built into the system. With a rotor diameter of just 5.6 feet and weighing only 33 pounds, this turbine is much smaller and lighter than most others on our list. With its warranty of just one year – compared to 5 years for more expensive turbines – we’d exercise caution moving forward with this one. Do your homework before purchasing and be sure to follow all the installation instructions exactly. However, if you’re looking for the cheapest wind turbine possible, take a look at this option. At a cost of $1/watt, you’re getting a real steal if it works well. The Skystream is an all-inclusive turbine for grid-connected homes. The inverter is built into the turbine, so you don’t need to worry about extra equipment – just connect it to your electrical box. With a 12 foot wide rotor and weighing 170 pounds, you can’t just throw it together like the Primus Air 30 above (which is a much smaller system). It comes with wireless monitoring and can be used both off-grid and on-grid. The Skystream enjoys a number of safety certifications from around the world, including UL certification for the US as well as certification from Australia and New Zealand, Hungary, and the UK. The manufacturer claims it can produce up to 400 kWh per month and offers a 5-year limited warranty as well. If you’re looking for a medium-sized wind turbine that is simple to set-up, you can’t get better than the Skystream. Bergey Windpower is one of the oldest wind turbine manufacturers out there, founded over 30 years ago! They specialize in turbines for both off-grid and on-grid residential and small business applications. They manufacture two models for on-grid use, the Excel 6 and the larger Excel 10. With three rotors and 23 feet in diameter, the Excel 10 sees high efficiency and produces 8.9kW – quite a bit of electricity! This isn’t something you can just throw up in an afternoon; we’re talking a team of workers and heavy-duty equipment. Bergey estimates this turbine will produce 13,800 kWh annually with 11 mph wind, more than enough to power an average sized home in the US. They work with certified dealers across the US who are trained in installing their products, so you know it’ll be done right. They aren’t the cheapest turbines, but the exceptional reputation and longevity of the business – along with their 10-year warranty on the turbines and blades – certainly balances out that cost. The Pika Energy T701 can be used in both off-grid and grid-connected situations. When you purchase their inverter (Pika X3001 Wind-Solar Inverter) you can pair your wind turbine with your solar panel installation as well, creating a pretty seamless ‘mini’ electricity grid on your property. At 38 decibels, the Pika T701 is the quietest wind turbine ever certified by the Small Wind Certification Council. With some owners and neighbors complaining about loud wind turbines (just Google it or watch videos on Youtube), this could be a welcome relief for homeowners who really value peace and quiet. The T701 is easy to install and wire up and, unlike other turbines that require yearly check-ups, Pika claims the T701 will last 20 years with no maintenance! The T701 also comes with Wifi monitoring so you can view performance data and troubleshoot any issues. The actual turbine is a little more expensive than others, but the easy installation process (the turbine can even be shipped by UPS) probably balances this out. If you’re looking for a quiet, hands-off installation, definitely check out the Pika T701! 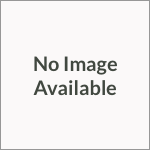 If you’re looking for a vertical wind turbine for home use, your choices are much more limited, as they simply aren’t as common as horizontal axis wind turbines (all of the above turbines fall into this latter category). In 2008, the National Renewable Energy Lab tested four different wind turbines, with Windspire agreeing to provide their own turbine for the project, a huge step forward in providing performance and safety data for the fledgling vertical axis wind turbines industry. While a few issues did happen during testing, including a burnt-out inverter, Windspire dealt with each issue in turn, and they continue to manufacture vertical axis wind turbines today. The turbines can be constantly monitored with the included Wi-Fi monitoring system. Rotor diameter is just 4.5 feet because of the rotor design, but the whole system weighs 775 pounds. It also enjoys a 5-year warranty. 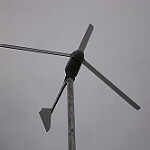 The turbine replaces Windspire’s older 1.2kW turbine, though this new model is not yet available online. 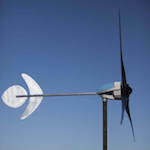 At $6.99/watt, this turbine is much more expensive than any of the others on this list. However, if you’re dead set on installing a vertical axis turbine, be sure to check out Windspire’s products. 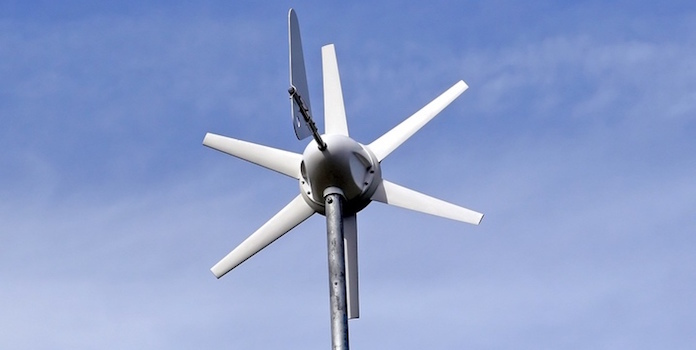 Home wind turbines come in all sizes and prices. No matter which one you choose, be sure to review the company’s reputation, quality, and warranty. Have any questions on wind turbines for your home? Do you have a wind turbine? Tell us about it in the comments below!